Like ’em or not…rules exist for a reason. Most of the time it makes sense to follow them rather than ignore or violate them. Here’s my most recent example. I was in a medical office for an appointment and a very legible sign was posted at the check-in desk saying: “For the comfort of our patients, cell phone use is not permitted in this office.” Pretty straight forward, don’t you think? The problem is that within 5 minutes of being in the crowded waiting room, a woman seated next to me answered her cell phone and began to have a lengthy conversation with the caller. Her best option was to step outside the waiting room into the hallway and continue her conversation. Other choices would’ve included speaking at a reduced volume, keeping her conversation extremely short, returning the call at a later point or simply turning her phone off when entering the waiting room. But instead, not only did this person take the call but she spoke quite loudly. 1. The extended conversation resulted in the woman’s personal information being known by everyone in the waiting room. So much for ensuring confidentiality. 2. Individuals in the waiting room had their comfort compromised and disrupted by hearing a loud conversation. 3. Office staff were not able to easily complete their duties in a quiet environment. As stated at the outset of this post, rules exist for a reason. Violating a rule makes it seem like we’re oblivious to others or intentionally don’t wish to show respect. This same scenario has occurred in libraries, restaurants and other public areas. Let’s all make a concerted effort to follow rules. 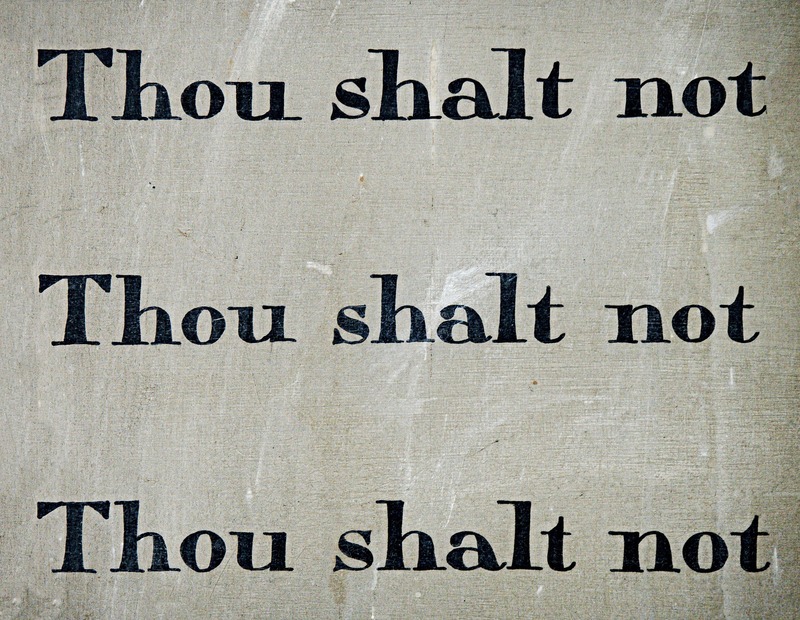 A good place to start is “Thou shalt not…” (fill in the blank). How will you apply this information to your communication?